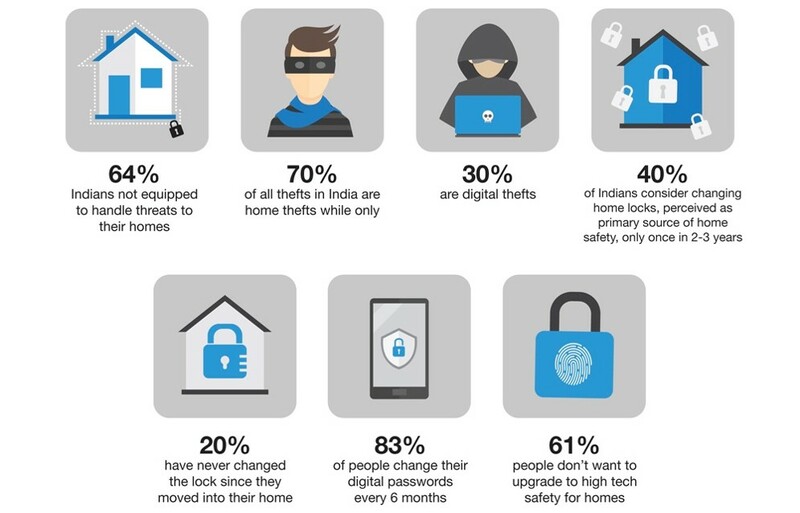 Indians are at risk when it comes to home safety as 64% people are not equipped to handle home safety threats such as burglaries, robberies, among others. This is according to Godrej LocksS ‘Har Ghar Surakshit 2018 Report: India’s Safety Paradox – Home Safety Vs Digital Safety’, conducted by Research Now. This report was released as a part of #HarGharSurakshit, a nationwide campaign by Godrej LocksS to promote home safety across Indian homes. Godrej LocksS ‘Har Ghar Surakshit 2018 Report: India’s Safety Paradox – Home Safety Vs Digital Safety’ focus on people’s perception of home safety in the digital age. Homes in India are not just a place to stay but are also considered as safe abodes for families. Indians store their important documents and credentials at home, along with money, jewellery, and other valuables. There is a lot to protect, but Indians seem to be lagging behind in upgrading even the primary source of protection of their homes i.e. locks as only 40% Indians change their locks in 2-3 years and 20% have never changed it. Godrej LocksS ‘Har Ghar Surakshit 2018 Report’ highlights that 70% of all the thefts that happen in India are home thefts and the other 30% being the digital thefts. Yet, Indians are more resolute in safeguarding just their digital assets instead of focusing on home safety. People have swiftly adopted technologies for their digital safety. As a matter of habit, 83% Indians change their digital passwords every 6 months more frequently than considering a safety upgrade for their homes. 67% change their PC passwords and 50% change their debit card PIN every 2 months. 50% also ensure they use a reputed anti-virus on their computers or mobiles. Over 55% use ﬁngerprint sensors on their phones to prevent unauthorized access. However, despite the day-to-day usage and awareness of technologies, Godrej LocksS ‘Har Ghar Surakshit 2018 Report’ indicates that Indians are reluctant in adopting them for securing their homes. 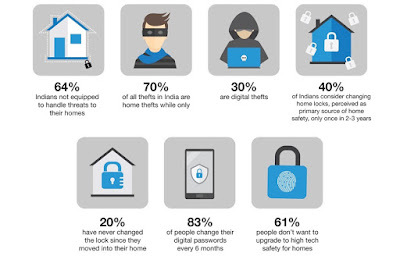 The report says 83% Indians are aware of digital/electronic locking technologies yet more than 61% do not want to embrace technology and upgrade to high tech safety solutions for homes. Indians enhance their digital safety actively due to regular updates of digital risks through information across platforms. They also receive reminders to change their passwords or upgrade their digital security level to the next advanced versions. Similarly, people are willing to enhance their home safety if they are made more aware and provided with information, which will bring about a behavioural change amongst citizens towards the perception of home safety. Through #HarGharSurakshit campaign, Godrej LocksS intends to bridge this awareness gap. The company has pledged an investment of INR 100 crore over the next 3 years towards #HarGharSurakshit and will be undertaking multiple initiatives through various platforms across India.